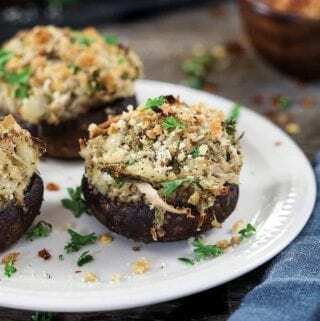 These Crabless Vegan Stuffed Mushrooms will be a hit at your next gathering and they will disappear fast. 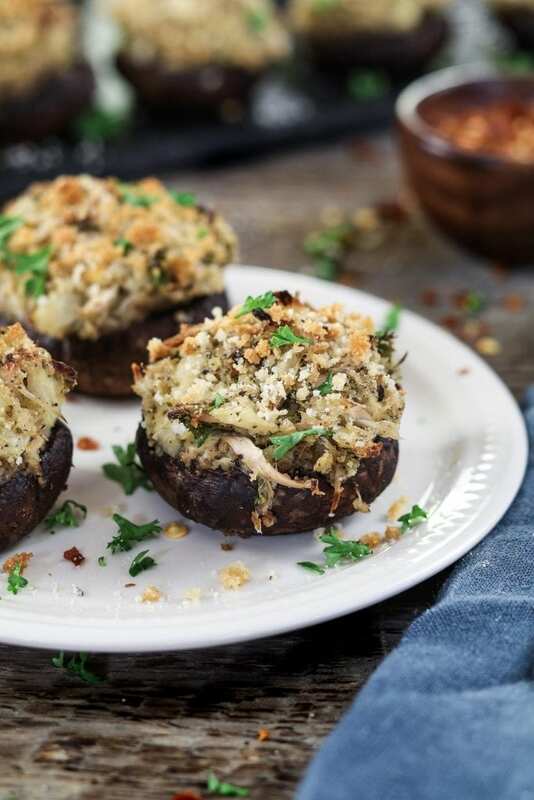 These Crabless Vegan Stuffed Mushrooms are simple to make and are totally delicious! The filling has a crab-like texture and an ocean-like flavor that will really fool your omni friends. They are a spin-off of my popular Vegan Crab Cake recipe. Our crab friends were not harmed in the making of these savory bites. The ocean flavor comes from seaweed and the crabmeat-like texture comes from hearts of palm. This year I want to do it simply and spend less time in the kitchen. 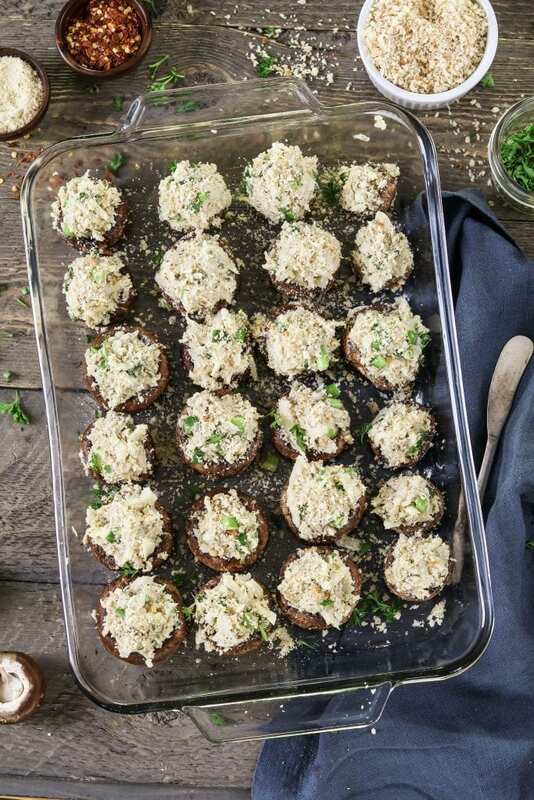 I’ll be making my Spinach Mushroom Lasagna, a big salad, Jam Thumbprint Cookies, and these stuffed mushrooms. Everything can be prepped ahead so I won’t have much to do the day of. Prepare the mushrooms by gently dry brush each mushroom using a soft brush. If they’re extra dirty, you can use a damp paper towel to clean them. You don’t want to soak them because they are like sponges and will absorb lots of water. That will result in soggy mushrooms. No fun! Now remove the stems by gently twisting them off. If a piece gets stuck inside the cap, you can gently cut it out. You won’t need the stems for this recipe, but you can save them for another recipe like veggie stock, mushroom gravy etc. Using a small spoon, scrape out the brown gills (*see photo). This will make lots more room for that delicious filling. Place them in the baking dish and lightly season with salt & pepper. You can also lightly brush them with melted vegan butter or oil if desired. To get the crab-like texture, you’ll need two cans of hearts of palm. I buy the whole pieces (not salad cut) so I can have larger flaky pieces in the stuffing. Drain and rinse them well. 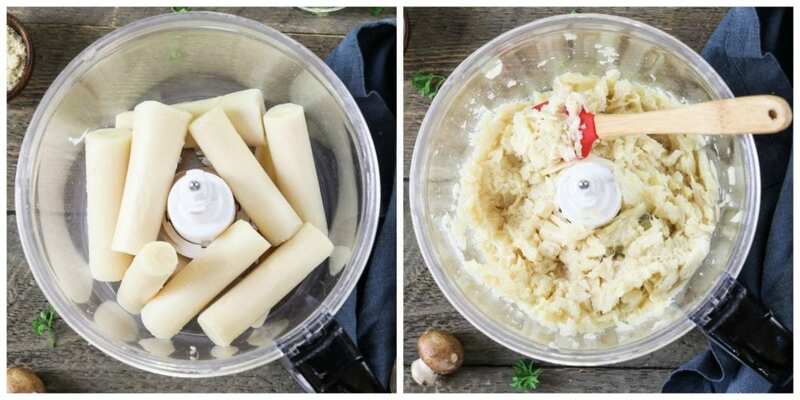 Add the hearts of palm to a food processor and give 3-4 long pulses, until shredded. Don’t over process or it will turn to mush. The mixture should have a crab-like consistency (*see photo above). *When I purchase hearts of palm, I look for labels that say “sustainably harvested”. Hearts of palm can be cultivated from a base plant. It has many branches & can be cut without killing the tree. This allows other branches to continue growing. I buy Native Forest, but there are other companies using the same practices. 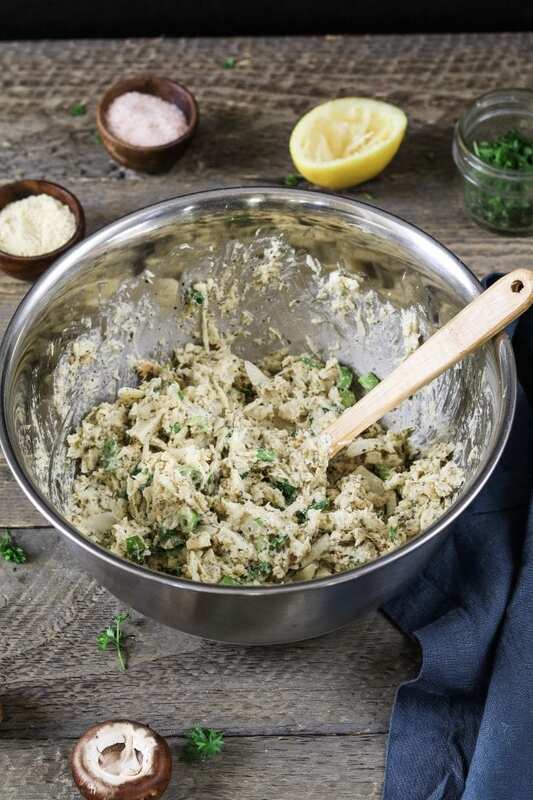 To make the filling,add vegan mayonnaise, lemon juice, mustard, vegan worcestershire sauce, nutritional yeast, kelp granules, parsley, garlic powder, Old Bay Seasoning, salt & fresh cracked pepper to a large bowl. Whisk to combine well. Add the shredded hearts of palm, bread crumbs, and green onion. Combine well. Now taste for seasoning and add more if needed. For a richer stuffing, you can swap out 1/4 cup mayo for a 1/4 cup vegan cream cheese or vegan sour cream. You can make filling the day before to make life easier for yourself. Just cover it and pop it in the fridge. * Worcestershire isn’t typically vegan, but there are lots of vegan versions to choose from. I purchase Annie’s or The Wizard’s brand. The Whole Foods and Kroger brand are vegan too. Make sure to read the labeling before purchase. * If you can’t find kelp granules, you can use dulse flakes, dulse granules or break up a small piece of nori. If you don’t want the ocean-like flavor, you can omit the seaweed altogether. The mushrooms will still be delicious! Now it’s time to stuff the mushroom caps and bake to perfection! 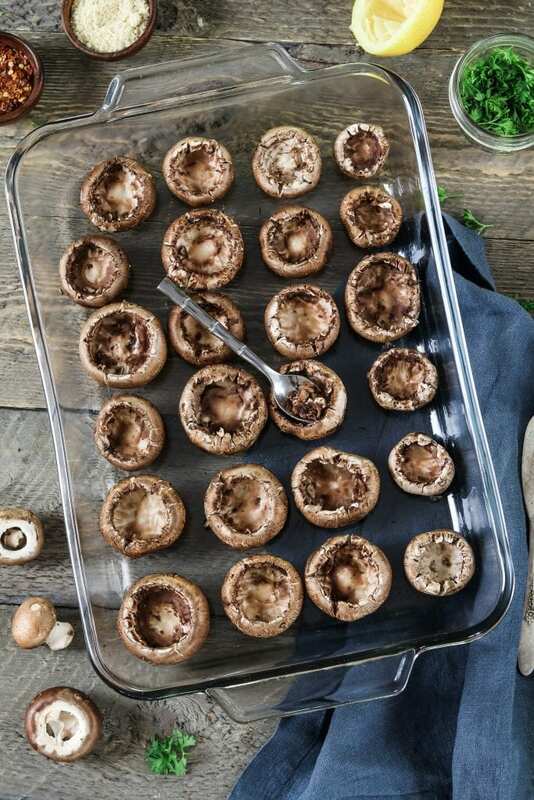 Using a small spoon, stuff each mushroom cap and place in a lightly greased baking dish. Sprinkle the tops with panko breadcrumbs. If desired, drizzle oil or melted vegan butter on top of the breadcrumbs to make them crisp up even more. You can also sprinkle shredded vegan mozzarella on top. So many tasty variations to try! Place in your oven and bake at 400° F for 20-30 minutes, until heated throughout and lightly browned and crispy on top. Serve them hot. Sprinkle with fresh-cut parsley, crushed red pepper, or vegan parmesan cheese, if desired. 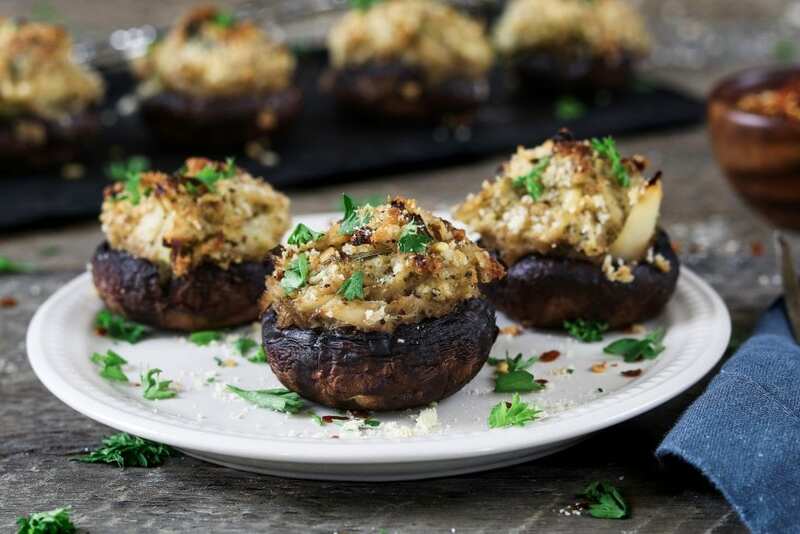 These Crabless Vegan Stuffed Mushrooms are simple to make and are totally delicious! The filling has a crab-like texture and an ocean-like flavor that will really fool your omni friends. Preheat oven to 400° F (200° C). Grease a 9x13 baking dish. Dry brush mushrooms and gently twist off stems. Using a small spoon, scrape out the brown gills. (*see photo above) Place them in the baking dish and lightly season with salt & pepper. To a large bowl, add mayonnaise, lemon juice, mustard, worcestershire sauce, nutritional yeast, kelp, Old Bay Seasoning, parsley, garlic powder, salt & fresh cracked pepper. Combine well. Add the shredded hearts of palm, bread crumbs, and green onion. Combine well. Taste for seasoning and add more if needed. Using a small spoon, stuff each mushroom cap and place in the greased baking dish (leave a small amount of room in between each mushroom). Sprinkle the tops with panko breadcrumbs and drizzle with oil if desired. Place in oven and bake for 20-30 minutes, until heated throughout and lightly browned on top. Serve hot. (sprinkle with fresh-cut parsley, crushed red pepper, or vegan parmesan cheese, if desired). * Cleaning Mushrooms: Use a dry, slightly damp paper towel or a soft brush to clean each mushroom. Mushrooms are like sponges and will absorb a lot of water which can make the mushrooms soggy. * If you can't find vegan Worcestershire sauce, you can use low-sodium tamari or soy sauce for depth. * If you can't find kelp granules, you can use dulse flakes, dulse granules or break up a small piece of nori. If you don't want the ocean-like flavor, you can omit the seaweed altogether. It will still be delicious! * For a richer stuffing, you can swap out 1/4 cup mayo for a 1/4 cup vegan cream cheese or vegan sour cream. * Fills about 24-28 mushrooms, depending on their size. * You can make filling the day before. Just cover and pop it in the fridge. I love stuffed mushrooms. These taste just like the real thing. +1 to my weekly food rotation! Love this! I’ve made it twice and both times, it was delish. This is for sure in my rotation of week night meals. Easy to make the filling ahead of time and then put in the oven after work. Thanks so much! How would I get it a bit crisper? Turn up the heat for a few minutes at the end? Do you use yellow mustard or dry mustard? These are delicious! I made these for Christmas dinner and am making them for New Year’s Eve. My non vegan family loved them!! I just made these and they were really good. I made a few minor changes. I used only 1/3 the nooch (as it can overpower a recipe) and I added about 20 pecans, broken into pieces by hand. And I air fried them, instead of baking. I did it at 360 for 15 minutes. Can you make the filling ahead of time?